Horse tied in stall. Photo credit: HorseRacingKills.com. Who is James Gagliano? Gagliano is the president and chief operating officer of The Jockey Club, which is a member of the Coalition for Horse Racing Integrity. Gagliano wrote an article for “The Hill”, Washington D.C.’s influential blog entitled, “Restoring integrity to horse racing“. I wonder why that is. In part the answer is the fact that the public has at long last caught on that U.S. racing matter of factly drugs and kills its horses. I will not sport with your intelligence by laying out his argument FOR H.R. 3084. We strongly encourage you to take a stand against this weak piece of legislation. For all intents and purposes it is useless. What we object to most concerning H.R. 3084 is that if anti-doping agency USADA withdraws is leaves horse racing once again to police itself. And we know how well that is working — a plethora of drugged and dead racehorses. In our opinion, Gagliano and his Coalition for Horse Racing Integrity have about as much interest in promoting the health and safety of racehorses as the people who take part in horse soring, slaughter, tripping, fighting and so forth. Come on, give racehorses a break will you? We urge everyone who cares about the lives of American racehorses to join us in support of H.R. 2641. Find your U.S. Representative. Jane Allin has written a comprehensive and illuminating report on this subject. Please see “Will federal legislation save American racing or help its horses? Don’t bet on it. ; Tuesday’s Horse; August 14, 2015. Pdf version here. See also Jo Anne Normile’s comparison chart relating to these two bills. • Make a donation to support our lobbying IN SUPPORT OF H.R. 2641 and against H.R. 3084. The lives of racehorses depends on it. • Learn more about H.R. 2641 at Thomas.gov. 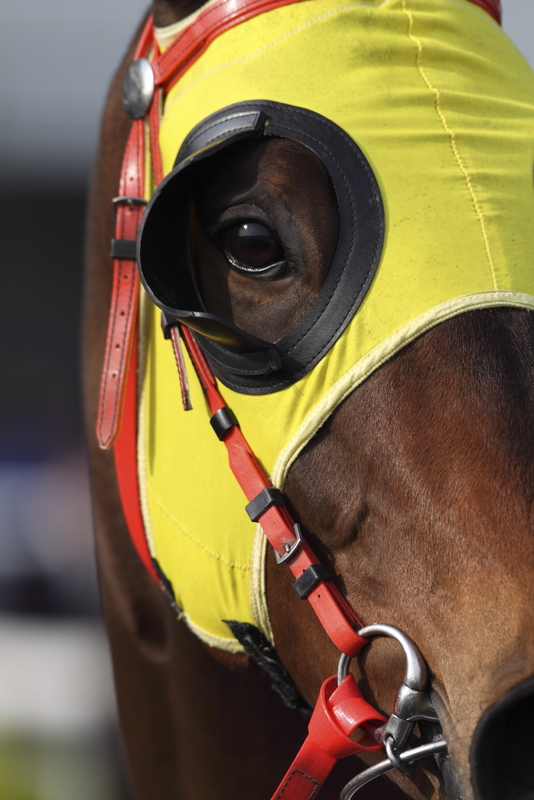 Will federal legislation save American racing or help its horses? Don’t bet on it! On July 16, 2015 Congressmen Andy Barr (R-KY) and Paul Tonko (D-NY), the co-chairs of the Congressional Horse Caucus, introduced the bipartisan Thoroughbred Horseracing Integrity Act of 2015 (H.R. 3084). The rationale behind the legislation is to establish a solitary, impartial organization that would create and enforce uniform national anti-doping regulations for Thoroughbred racing. Currently the industry operates under a diversity of inconsistent rules that govern medication policies and practices across 38 fragmented and dysfunctional racing jurisdictions in the U.S. Under the direction of the U.S. Anti-Doping Agency (USADA) – a non-profit, non-governmental anti-doping authority – a national uniform medication program, with input from the Thoroughbred racing industry, would be established to encourage fair competition and a level playing field across state lines. According to Cot Campbell – the pioneer of high-profile racing syndicates – and of course the bill’s stated goal, not only would it fulfill the need for uniform regulations, it would magically restore the face of American racing and ultimately bring it in line with the rest of the world. “A national medication program, developed and administered by this agency can quickly bring rigor, consistency and greater integrity to Thoroughbred racing. Well I hate to burst the old guy’s bubble but there is a glaring problem with this legislation. While I am in total agreement that uniform regulations and the need for industry reform is long overdue, what this bill fails to address is the very crux of what is wrong with American racing. And despite the fact that the bill would create an entity called the Thoroughbred Horseracing Anti-Doping Authority (THADA) comprised of six USDA representatives (CEO and board members) and five at-large directors nominated by the USADA from the Thoroughbred industry itself, THADA’s control will be limited. The bill does allow for some leeway and inclusion for state racing commissions to either take on some aspects of the new testing or to work in concert with THADA authorities in their states. 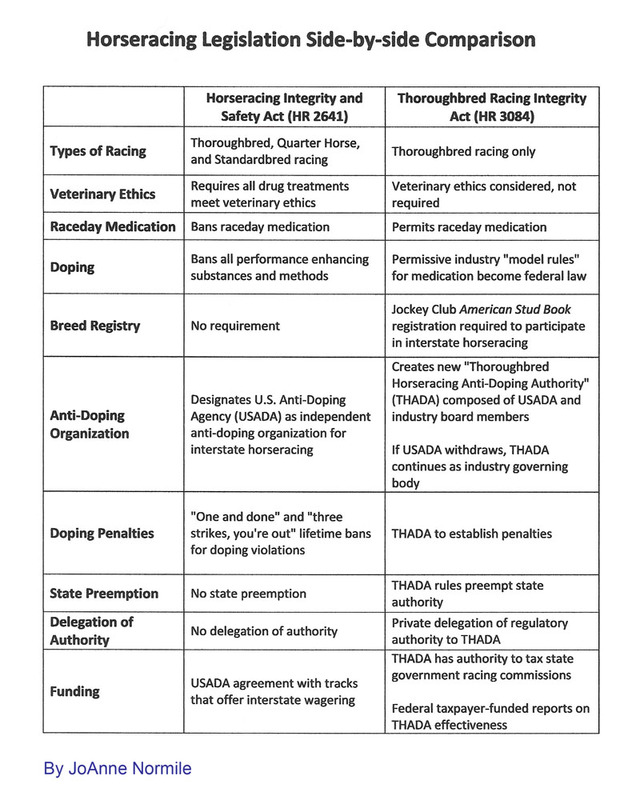 Under a “Duty of Cooperation” section of the legislation, THADA may determine that if states demonstrate regulatory competency, “a particular state racing commission will be able to implement a component of the Thoroughbred horse racing anti-doping program in accordance with the standards and requirements established” by THADA. “In other words, there’s an opportunity for state racing authorities to maintain their control over the medication issues if they desire, but they obviously have to be implementing the national uniform program,” Barr said. Let’s be honest. This legislation does little to change the face of racing in the U.S.
Its sole function is to award a central organization – one that, in essence, will be controlled by the racing industry itself under the false pretense that the USADA will be the regulatory body – the power to deal with cheating on a more uniform platform. That’s it. The cheating will continue despite uniform medication rules. Uniformity isn’t the issue, enforcement is. And if nothing changes on that front then it’s business as usual. All this legislation provides is a smokescreen under the false guise that the industry actually cares. It is merely desperation coming from an industry fraught with corruption and addicted to the status quo. It’s not about the horse; it’s all about placating the racing industry and allowing this depraved sport to continue without regard to the exact creatures that enable it – effectively hostages of a gambling industry. In fact when the Barr-Tonko bill was introduced to congress in July, Gretchen Jackson, one of the founders of WHOA, voiced her dissatisfaction, lamenting the fact that WHOA and other organizations were duped by this legislation that effectively keeps the racing industry in control. “Yesterday a bill to unify Thoroughbred horse racing rules was introduced to congress. It was a positive step in the right direction–it had the backing of The Jockey Club, the Breeders’ Cup and WHOA, the grassroots movement to end all raceday medications. While it was an attempt to clean up racing and establish U.S. racing as congruous with the rest of the world, it failed to eliminate raceday drugs. The rest of the world bans raceday drugs. WHOA was created by George Strawbridge, Julia Jenkins, Staci and Arthur Hancock, Paul and Melissa Sullivan and Roy and Gretchen Jackson. We all trained to Washington to meet with congressmen and senators to implore their help before our beloved sport imploded from chemicals. We worked hard and none worked harder than the Hancocks. Congressman Pitts and Senator Udall heard us and wrote a very powerful bill that they introduced before congress several months ago. This bill states that race day drugs will not be tolerated. USADA will be in charge of running the testing–random, out-of-raceday testing will be in place and, most importantly, the bill would place American horse racing on par with the rest of the world and its standards. To sum up my feelings and thoughts about WHOA at this point: WHOA without consent of all its founding members, and advisory board, has signed up and supports the wrong bill. If other members are disappointed and confused I share their stance”. Clearly these bills are in stark contrast – one calls for sweeping changes to medication regulations across the entire corrupt and dysfunctional racing industry in the U.S., the other? Not so much. In fact, HR 3084 contains some controversial details. For one, if the USADA withdraws what’s left to regulate the industry? Why of course the racing industry itself – back to square one, exactly where the racing industry wants it to be. Secondly, and more alarmingly, are the words “Permissive industry “model rules” for medication become federal law”, meaning that once enacted the tolerated use of all of these questionable drugs will become the edict of the Thoroughbred racing industry – no turning back or at the least very difficult to undo in the future. What’s more, if this is the case then the fate of American racing is sealed – it will never, ever achieve a level equivalent to that of international jurisdictions. Just more of the same rhetoric and illicit drug use that continues to kill horses at an unprecedented rate. But there is yet another dark side to all of this, one that most in the industry don’t consider to be a problem contributing to its ruin but rather use it to their advantage to promote this so-called “sport”; the gambling component and the fact that without the wagering public horse racing in North America would cease to exist. This aspect of the racing industry is part of the propaganda this legislation addresses. The way this legislation is written it is unlikely that it will improve the safety and welfare of the horses and jockeys – the trainers and vets will still be using the same “therapeutic medications” they always have in dangerous combinations either as performance enhancers or pain-masking agents. But no doubt it will cast the illusion that things are on the level when it comes to wagering and thereby fatten the purse so-to-say. Exactly what the doctor ordered. In fact, Senator Tom Udall (D-NM) and Representative Joe Pitts (R-Pa), co-sponsors of the Horseracing Integrity and Safety Act (HR 2641) introduced in early June, also introduced legislation on April 30, 2015 that would see the elimination of most wagering on horse racing by repealing the Interstate Horse Racing Act of 1978 which permits “off-track” and online wagering. The two bills are named in honor of horses who died while competing in races with interstate, off-track wagering authorized under the Interstate Horse Racing Act of 1978; (1) Teller All Gone Horse-racing Deregulation Act of 2015 (S. 1174) and; (2) Coronado Heights Horseracing Deregulation Act of 2015 (H.R. 2182). Teller All Gone was an American Quarter Horse who on September 3, 2011, during the fourth race of his life, broke down, after breaking a front leg. He was euthanized on the track then his body dragged off behind a barn, where he was dumped on top of the dirt next to an old toilet and some used surgical gloves. Coronado Heights, a 4-year old Thoroughbred trained by Todd Pletcher, whose records show had “early degenerative joint disease,” suffered a fatal breakdown at Aqueduct after receiving 13 injections for pain and cartilage damage in the month before his race. This is the real face of American racing. “The National Thoroughbred Racing Association (NTRA) strongly opposes this most recent attack on horseracing by Sen. Udall and Rep. Pitts, who have introduced federal legislation that threatens to destroy the economic viability of the $26 billion horseracing industry and the 380,000 jobs it supports nationwide. Unashamedly it’s all about the bottom line. Jo Anne Normile, author of ”Saving Baby” (http://www.savingbaby.com/) speaks the truth regarding the gambling component of American racing in her response to a blog written by Wayne Pacelle (President and CEO of HSUS), supporting Thoroughbred Racing Integrity Act (HR 3084) and declaring that racing can be made “humane”. The HSUS is part of the coalition in support of the Barr-Tonko Bill. “Horse racing is a form of gambling pure and simple. Take away the gambling component and the whole thing collapses. Horse racing has been on the decline (just check out the Jockey Club Online Fact Book) for decades. People were so disinterested in attending every day races that they had to have a federal law passed allowing them to simulcast their races for gambling across state lines — the only gambling entity allowed to do this. Despite these offsite wagers now comprising 90% of their gambling intake, they began whining about state lotteries and casinos so then they were allowed to have slot machines or “racinos” or free-standing casinos began giving them handouts and inflating purses to the point Stevie Wonder can see the horses racing are lame yet the track veterinarians legally required to do pre-race lameness exams cannot find anything wrong with them. The three racing stewards who are also to protect the horses and integrity of this gambling game? They were nicknamed eons ago “The Three Blind Mice”. I’m with JoAnne all the way. In any case, let’s be honest. A bill such as this (Thoroughbred Racing Integrity Act H.R. 3084) is a clear indication that most within the racing industry really don’t want to clean it up – at least not clean it up in terms of the welfare of the horse. If you read between the lines it’s all about increasing the “commerce” – making it more “just” for the gambler – and even then a thinly veiled diversion. There is nothing “ethical” about it. Seriously, failing to address the core of the issue – drugs – is simply a misguided attempt at trying to hoodwink the public. If the endeavor was earnest there would be sanctions put on the types and number of medications allowable in addition to abolishing race day drugs. It is time for the witch doctors to be held accountable – and that means not just the trainer, but the veterinarians and the owners, each and every one of them. Surely if the owners shared the disgrace then they would police the trainers. And as anyone remotely involved with racing knows, cheating is widespread in the industry. Compounding the issue is that the richest in the game can afford the best chemists. Many of the elite trainers are the biggest offenders and the repercussions of getting caught? Swept under the rug – accidental, coincidence, contamination. Without a doubt the insurmountable problem is that drugs are inextricably entwined with racing here in North America. Mesmerized by the veterinary industry, the American racing community has “cult devotion” to “necessary and humane” medication which steps beyond the boundaries of ethical conduct. One need only look at the ludicrous Lasix debate which ignores the fact that most racing around the globe is Lasix-free. In fact it’s hard to take any legislation of this type seriously when it fails to address the Lasix issue, which, as much as any other medication, compromises both horses and integrity under the false guise of treating horses that bleed. Despite how urgently the need for change is, this legislation will not be the answer. All it manages to do is kick the ball back into the racing industry’s court while at the same time making it appear that the Federal government is in charge and will inexplicably solve all the sordid problems of a game gone wrong. No. Change is not on the horizon for American racing because pulling back the covers to reveal the beast that thrives beneath those covers is simply too terrifying. • Pdf version of this report. Download here. Appreciation of the evolved nature and behavior of horses provides the foundation for the veterinary care of equine athletes. The establishment of a veterinary patient client relationship (VCPR) is instrumental in providing ethical care for the competition horse. Ethical veterinary practice supports the horse’s long-term health, therapy, and welfare interests while avoiding pharmaceutical intervention in the days before competition. Horses evolved as social grazers of the plains, moving and grazing in a mutually connected and communicative fashion on a near-constant basis. Contemporary equine health and prosperity remains dependent on providing an acceptable degree of this continual movement, foraging, and socialization that sustain equine health. When horses are confined to fulfill convenience and performance interests, the horse’s natural preferences need be re-created to a suitable degree to avoid exceeding the adaptability of the stabled horse. When adaptability is exceeded, welfare is diminished and the need for medical intervention to remedy behavioral, health, and soundness deficiencies becomes complex. Contemporary husbandry and conditioning practices regularly exceed the competition horse’s adaptability, resulting in the need for extensive veterinary intervention to sustain health and competitiveness. Ethics need to be improved to protect the future health and welfare of competition horses. Pre-competition medication strategies should not supplant or replace the appropriate fulfillment of the horse’s long-evolved survival requirements. The more medical care and pharmaceutical intervention required to sustain a population of horses, the lower the population’s welfare. Ethical veterinary care supports the horse’s best welfare interests, as well as the safety of horse and rider. Veterinary caregivers are required to provide equine athletes with appropriate medical and surgical therapy for a wide variety of infirmities. To properly support the health and welfare of equine athletes, the practitioner must deviate from pharmaceutical pre-competition intervention to providing for their patients’ inherent and individual long-term conditioning and husbandry essentials. While necessary therapies are being instituted by the practitioner, socialization, constant foraging, and abundant daily locomotion need to be initiated. Providing the long-evolved requirements to promote and sustain optimal soundness, behavioral health, and performance is essential to promote healing in competition horses. Once most injuries are stabilized, stall rest is not the correct ameliorative approach to resolve lameness. Healthy horses are best-served to perform naturally in an unmedicated state. Due to a lack of cultural appreciation of the nature of the horse, medication is heavily regulated in jurisdictions worldwide to protect the horse. It has been demonstrated—in Hong Kong and Great Britain, for example—that fewer pre-race medications allow safer horseracing. All competitive equine pursuits require medication policies due to the potential of unscrupulous medication practices to gain competitive advantage. Polo, endurance, cutting, reining, rodeo, and all unmentioned performance horse pursuits are required to follow the same ethical approach. Medication should not influence performance. The equine practitioner best serves the horse and client by focusing on post-performance evaluations and therapeutic approaches. Appropriate treatments and protocols to sustain horse health can be implemented on an enduring basis when conditions are identified during post-competition examinations. The performance horse veterinarian needs to change their work schedule from pre-performance to post-performance. There, the doctor can do right by the horse. A behavioral emphasis on fulfilling the medical, physical, nutritional, metabolic, and behavioral needs of the horse to prepare for future competitions provides a solid platform for the ethical veterinary care of the competition horse. Horses so served prevail at the competitions. The pre-competition veterinary role is to guide the client to prepare a strong horse who is sound and able to compete safely, willingly, and efficiently in a natural fashion. Pre-competition pharmaceutical scrims have little place in the ethical practice of competition horse medicine. Pre-competition practices that replace or supplant appropriate health care are not in accord with the AVMA Principles of Veterinary Ethics. The AVMA Principles of Veterinary Ethics state that it is unethical for veterinarians to medicate or treat horses without a VCPR. The use of itinerant veterinarians to inject Lasix into nearly all horses racing in America hours before they race is an example of the unethical practice of veterinary medicine. The result is horses breaking down three to four times more often in America than in overseas jurisdictions where horses are prevented from being medicated before racing. The medical and pharmaceutical practices that support equine competitive pursuits enhance the health and soundness of the horse on a long-term basis. Pre-competition medical influence should not enhance performance nor be intended to enhance performance. When performance is enhanced, the adaptability of the competition horse is exceeded and catastrophic results ensue. Pre-competition practices should not mask lameness of any sort. All sensation, behaviour, cognition, and proprioception should remain uninfluenced by medication during competitions. Treatments should not effect normal physiologic function or behavior of the horse. Senses should not be dulled, masked or stimulated. Performance horses should not perform under the influence of medications that are capable of initiating an action or effect upon the nervous, cardiovascular, respiratory, digestive, urinary, reproductive, musculoskeletal, blood, immune (save approved vaccines), or endocrine systems. Endocrine secretions or their synthetic substitutes, masking agents, oxygen carriers, or chemicals that directly or indirectly affect or manipulate blood physiology or gene expression are not appropriate for use in competing equine athletes. Horses are vulnerable to performance manipulation via pharmaceutical influence. The only fair competition is a competition for non-medicated horses. Sound horses properly prepared have little need for pre-competition medication. Unsound or behaviorally dysfunctional horses require rehabilitation that restores soundness before training and competition are resumed. All horses need to be professionally prepared physically and behaviorally to endure the task asked of them. Musculoskeletal development requires lifelong, constant attention, most notably in the stable. Horses are born to move most all the time, and move they must to maintain health and soundness, especially in preparation for competitive pursuits. Top Photo: Horses gallop out in a race in Australia. Google image. This brings us to the claiming races. From available information, probably over 70% of races taking place in North America are claiming races. One a horse wins — or breaks his maiden — that number rises. Claiming races have different levels of competition because just as not every horse race is created equally, neither are the horses. To envision how races are organized think of a pyramid where each of the levels represents a class level. At the base of the pyramid are the maiden horses which are those horses who have never won a race and at the top are the very best horses who compete in the stakes races. In between these two categories are the horses who run in what are known as claiming races which are based on parity – pitting horses of similar ability against each other to make for a competitive field. Needless to say that the lower the level the more perilous it becomes for horses. These bottom feeder claiming races are where the spent horses bide their time, changing hands again and again. Horses can be seen streaming past from the on track casino at Aqueduct. Photo: Chang W. Lee / NYT. This is also where the curse of “racinos” – racetracks with casinos that offer gambling facilities for playing the slots, blackjack, roulette and other forms of non-horse betting gambling – occur. The glut of money provided from them sweeten the purses of these lower end races ultimately leading to catastrophic risks for these innocent horses. A 2012 New York Times article authored by Joe drape, Walt Bogdanich, Rebecca R. Ruiz and Griffin Palmer; “Big Purses, Sore Horses, and Death” describes the grim realities associated with these venues. 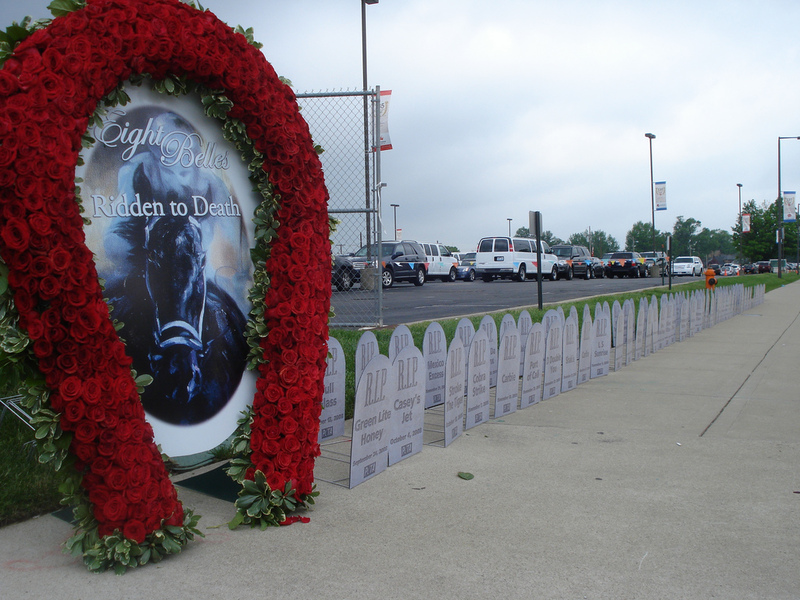 “Since a casino opened at Aqueduct late last year, offering vastly richer prizes, 30 horses have died racing there, a 100 percent increase in the fatality rate over the same period the previous year. Like Wes Vegas and Coronado Heights, many had been injected repeatedly with pain medication in the weeks before their breakdowns, according to a review of veterinary records by The New York Times. “At Aqueduct, horses worth $7,500 — at the lowest level of competition — recently raced for a $40,000 purse, nearly four times the recommended maximum. Two of them broke down and had to be euthanized. Both had been given pain medication in the days leading up to the race. In all, 19 of the 30 Aqueduct deaths occurred in races where the veterinarians’ standard was violated. What it all boils down to is getting those horses onto the track without the slightest regard to their welfare – greed. And when horses don’t win, regardless of the level of competition it seems, there is always the dreadful prospect of the slaughter pipeline. Every year thousands of racehorses make their way to the slaughterhouse through clandestine channels. Some resources claim that anywhere from 10% to 20% of the horses slaughtered annually in North America who end up on the plates of (mostly) foreign patrons of restaurants serving “cheval” are Thoroughbreds. Horse slaughter statistics show that since the shuttering of the US horse slaughter industry close to a million American horses were slaughtered between 2008 and the end of 2014. If even 10% of Thoroughbreds were included in these statistics, that is still 10% too many. In fact, a million slaughtered horses is a million horses too many. While all of this depravity is taking place the racing industry continues to breed thousands of horses each year. And what’s worse, breeding for speed rather than soundness and stamina. At best, these fragile horses will race for 6-7 years, many of whom fit the description of the cast off, racing their hearts out for their countless owners in the claimers only to be discarded at the bitter end of their racing careers. Others may only race 4-5 years and for the elite crop a total of 2 years for the “champion runners”, or possibly 3 years for those that need to further prove themselves, before they are shipped off to the breeding shed to live a life of relative misery. A horse’s lifespan is upwards of 30 years. Apart from the broodmares and stallions who will be used to perpetuate this incessant cycle, what have these breeders planned for the rest of these horses’ lives after the end of their short racing careers? Short because they are weakened from racing before their skeletal structures are fully developed, even with the cornucopia of drugs administered to alleviate injuries and pain, or invariably through death because of the breakdowns caused by the combination of drugs and an immature skeletal structure. The majority of these breeders haven’t given pause for thought to the fate of these horses inconsiderately assuming that once they are sold to the highest bidder it’s simply not their problem anymore. Passing the buck, so to speak. The Bob Baffert trained Secret Compass won the G1 Chandelier before breaking down in the Breeders’ Cup Juvenile Fillies, a race for 2 year olds. Baffert reportedly voluntarily turned over vet records on Secret Compass. And why wouldn’t Teflon Bob? This attitude and what follows the sale of these creatures is simply inexcusable. “The owners are to blame for permitting their trainers and veterinarians to give drugs to their horses on such a scale. The trainers are to blame for putting their financial interest above the interests of their horses’ welfare. The veterinarians are to blame for allowing themselves to be used as instruments of the horses’ destruction. Track officials are to blame for not taking seriously their obligations to ensure the safety of the horses. And regulators are to blame for not punishing even the obvious offenders. Insofar as uniform drug testing and regulations are concerned the effort put forth by the racing industry authorities has been hapless to that end. The industry has been talking about cleaning itself up for years. After the PETA video surfaced over a year ago there was a whirlwind of activity relating to how they would change things for the better, about how they would create a level playing field, about how their efforts would benefit the welfare of the horse. What has come of this? Nada. It’s all talk and no action. Just meetings, symposiums and the like held amongst the same racing authorities and “experts” as always, discussing it and developing strategies but failing to put into action what they put into words. Part of that is because no one really wants to change. All the while the horses at the mercy of their non-action. In the past there have been attempts by a number of organizations (The Jockey Club, WHOA, etc.) to push for reform within the industry however the vast majority of their efforts have been thwarted by those who possess the power to change it all. Just recently New York Congressmen Paul Tonko has stepped up to the plate. “New York Congressmen Paul Tonko, co-chair of the Congressional Horse Caucus, has announced plans for legislation that would create a level playing field for horses, jockeys, trainers and owners that compete, as well as the fans who wager their hard-earned money on our sport. This legislation would grant rule-making, testing and enforcement oversight to an entity created by the U.S. Anti-Doping Agency at no cost to taxpayers. USADA is a national, independent, non-governmental organization with a track record of creating uniform standards and science-based oversight to protect the rights of clean competitors and the integrity of competition, including cycling and the Olympics. Only an organization like USADA can create and maintain a system that protects horses and the future of Thoroughbred horse racing for all of our participants and fans. Well, no doubt a step in the right direction. But while uniform regulations and drug testing would level the field across the 35 state racing jurisdictions, how do they propose to stop the unremitting use of the trainer’s secret artillery – the therapeutic medications? These are the real culprits of racing’s woes and afflictions. While the elimination of race day drugs and lowered thresholds should be a given if the industry is serious about cleaning itself up, the biggest hurdle will be to curb the insidious use of drugs leading up to race day. These are the drugs that are incrementally destroying the horse, particularly young horses racing on immature skeletal structures. I for one am not holding my breath; the racing industry is so corrupt I believe it is past the point of no return. The sad part is that they will use the Triple Crown in an attempt to diffuse all the bad that exists. This is a marketing strategy that is simply a thinly veiled smoke screen without merit or substance. Sorry but no one is buying what you are selling. American Pharoah. Photo by the Associated Press. American Pharoah is yet another pawn in their evil game. What a circus it all is. “The alleged behavior goes on, decade after decade, because the industry is unwilling to police itself. Because state regulators are feckless and because there is no uniformity among racing jurisdictions. Because the people who develop performance-enhancing drugs are almost always one step ahead of the officials developing tests for those drugs. Because veterinarians give their horses too many drugs too often. And because too many still within the sport equate real reform with a bad-for-marketing acknowledgement of how bad things are. Well, guess what. We are here. There is no longer a man behind a curtain. “How about telling the truth? It can finally set this industry free. Instead of pretending this problem of abuse does not exist, or claiming that the problem is under control, the sport can take the bold leap it will need to take to get to the other side—the side where animal activists aren’t picketing racetracks. That will mean more money for enhanced drug tests. It will mean legislative efforts to better regulate trainers and veterinarians. It will mean swifter and stricter punishment for offenders. It will mean an end to the insider’s code of silence.